I’ve not been to the Tamaki West Road entrance to the Ruahines for a few years, but recently we went back with an intent to cross to the other side, following what seemed to be the most obvious route along rivers. There’s a nice campsite, with a shelter and toilet blocks, about 200 metres in from the gate at the road, and we slid into here to camp on Friday night. Near dusk outside Mid Pohangina Hut. 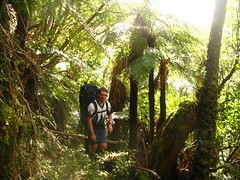 Location: Ruahine Forest Park, from Tamaki West Road to Pohangina Valley East Road. People: Tim, Richard, Éamonn and me. 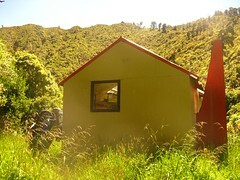 Huts visited: Stanfield Hut (0 nights), Cattle Creek Hut (0 nights), Mid Pohangina Hut (1 night). Route: Starting from Tamaki West Road, follow the Holmes Ridge Track to Stanfield Hut, then to Cattle Creek Hut via spot-height 908. 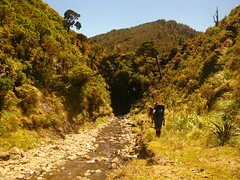 Continue along the river route to Mid Pohangina Hut for Saturday night. 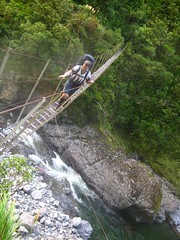 Out to Pohangina Valley East Road via sidle track on Sunday. 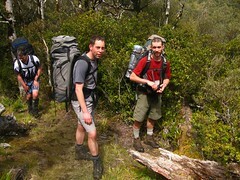 The four of us left at about 7.45am on Saturday morning, at first aiming for Stanfield Hut. 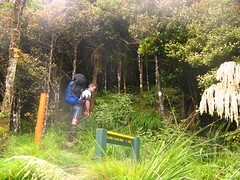 There are at least three routes to Stanfield, one heading straight up past Travers Hut, along the tops on the true right of the West Branch of the Tamaki River, and straight down. 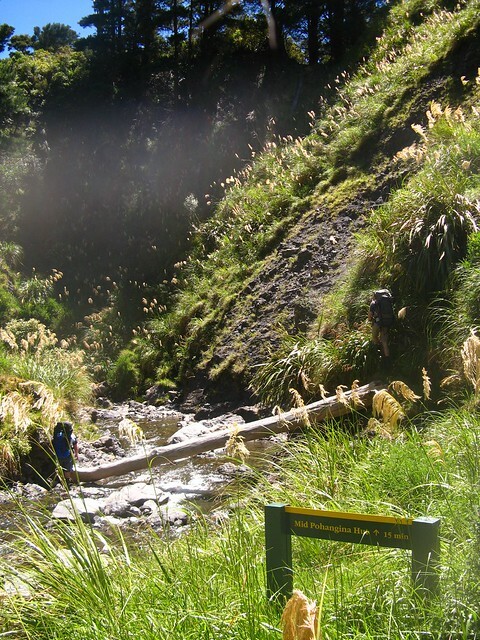 If a 700 metre climb feels pointless, it’s also possible to walk straight up the West Branch of the Tamaki River, or otherwise do what we did, which is to follow Holmes Ridge along the true left of the river. The weekend’s forecast was to involve lots of sunshine, but things stayed very muted for us during most of the morning—I think if we’d gone via the highest route, we’d have simply been walking in clouds all morning. lower end of Holmes Ridge. 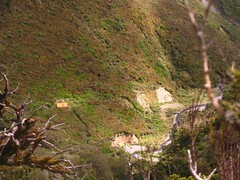 The Holmes Ridge track is marked with a big orange triangle over the river directly opposite the campsite, and the route soon climbs to a high point of 658 metres, which is about a 200 metre climb from the starting point. Recent LINZ Topo50 maps mark the ridge with a walking track, but after the first 10 minutes it joins old 4WD track—Tim and Éamonn (who were ahead of Richard and I) met someone in a 4WD soon after we left, but that was the only person we met on the ridge. The track eventually heads into trees (about an hour after we began), and the 4WD track abruptly stops, so I suppose there’s only so far that someone could go with a vehicle before they have to park it and either camp or walk, or go hunting or whatever. 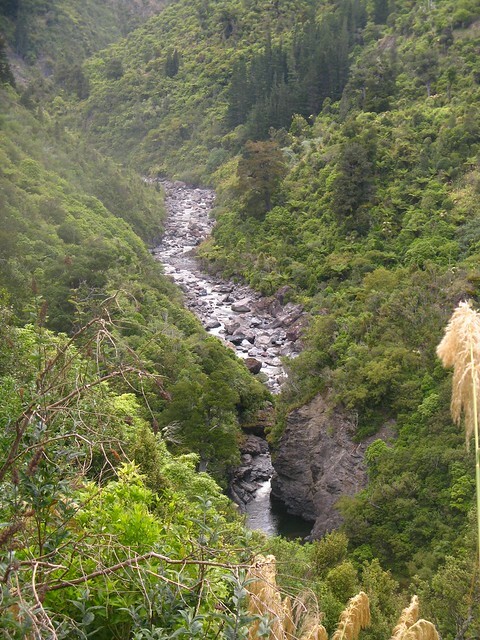 A little before 9am, we’d followed the track back down into the Tamaki River, from where there’s about 15 to 20 minutes of waltzing up the river to Stanfield Hut, also usurped as Department of Conservation Asset Number 042422. 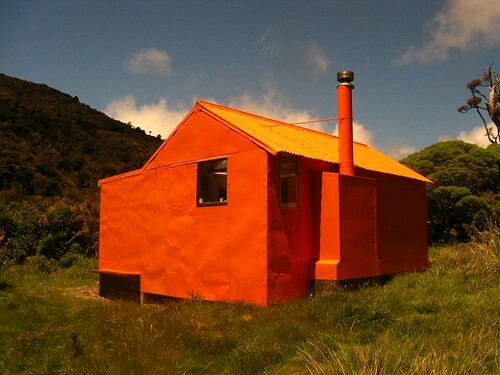 Stanfield’s a classically painted NZ Forestry Service Bright Orange, and more elegant than a simple box. It was very tidy when we arrived, and kind’a cute. It took us about 75 minutes to reach, although the signposted time was about 2 hours. The next stop would be Cattle Creek Hut, located a hop over into the next catchment so we’d definitely need to climb a bit. We debated the prospects of finding an alternative route to Cattle Creek Hut by heading over Takapari (1258), then bashing down one of the spurs to the north-west, possibly even bypassing Cattle Creek Hut altogether on our way to Mid Pohangina. Unfortunately nobody had researched or knew enough about that area, and being the Ruahines we didn’t really want to get stuck in a sea of leatherwood. Thus we continued for 7 minutes further up the river, looking for a nice entrance to the north-east spur that leads up to spot-height 908. We passed what looked like a commonly-used ground trail onto the spur, but someone had placed a barrier of sticks in front of it. 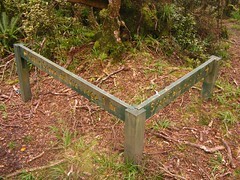 Sure enough, a minute or two later, we reached a signpost and triangle that indicated a more “official” track towards Cattle Creek Hut. I doubt it would have mattered because very soon after we began climbing, we passed the other end of the original ground-trail, looking very open and easy albeit blocked by someone’s structure of sticks. It’s probably eroding more quickly down that way, though, so fair enough. I’m only guessing in hindsight). Spot-height 908 would be about the high point for the entire weekend, and being higher than Holmes RIdge things were now mildly less farm-like. I gazed over to Takapari on our left, trying to pick out any nice ground trails that might make it easy to get there directly. Such a ground trail may exist, but all I could see was a sea of leatherwood, and things that I strongly associated with leatherwood in my mind. (I’m sure it’s not all leatherwood, but there are mysterious things out there worse than leatherwood.) In hindsight, I’m now curious if there might have been a bit of a ground-trail leading off from an obvious corner in the track. The corner was very obvious because there’s a giant right-angled DOC sign at about BL36 606587 that points down the hill to Stanfield Hut, or 90 degrees away labeled as “Cattle Creek Hut via Ridge”. I suppose if something turned off that way, it might simply be an alternative route to Cattle Creek Hut via the river, rather than heading up to Takapari. For anyone considering this route, it’s worth noting that this ridge can become very windy at times, and later on we found vast numbers of hut book entries where people commented about very strong wind, which is also consistent with my experience the previous time. At 10.55am, we reached a point of the ridge where we could finally look down and spot the bright orange Cattle Creek Hut at a distance. On this day there was virtually no wind, but 3 years ago I remember having trouble standing up. 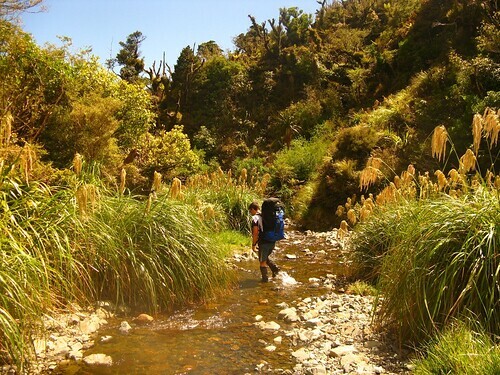 At 11.10am, we found the track junction where it’s possible to continue walking north along the ridge towards Apiti Saddle, or drop 120-odd metres down to Cattle Creek Hut. In hindsight if we’d wanted to, we most likely could have made a longer walk by aiming for Apiti Saddle and getting across to Ngamoko Hut, but we already had our minds set on Cattle Creek. 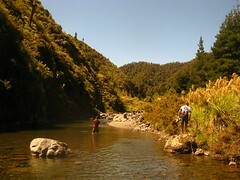 the tributaries of the Pohangina River. It’s a quick drop down to the hut in the increasing sunshine. The only distraction was at 790 metres (still 70 metres above the river) when I nearly stepped on a frog that leaped across the track in front of me, which I later figured out was either a Golden Bell Frog or a Southern Bell Frog. I think the latter’s more likely, because Golden Bell Frogs aren’t supposed to be seen so far south. I didn’t really expect to find a frog 80 metres above a river, but maybe it gets around, or possibly there was a less obvious water source nearby. Within 10 minutes of leaving the ridge, we were walking into a sunny Cattle Creek Hut, where we stopped for about an hour lunch. 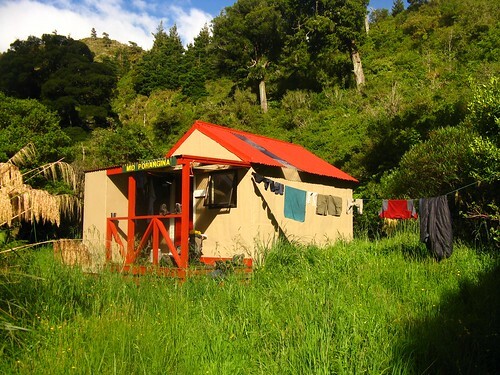 The hut is locate a short and easy climb above the river, but still has its own water tank. I dried out my tent fly. 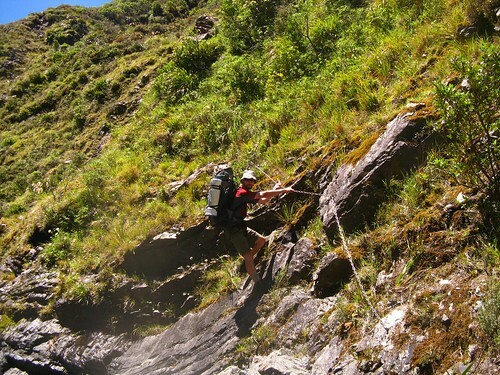 Richard hops over a low-running creek to reach Cattle Creek Hut. Note the dominance of slippery brown rocks, which was the story of things for the rest of the way down. 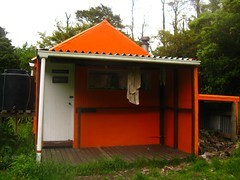 Cattle Creek Hut, seen from behind. Don’t believe the “1 hour” time. 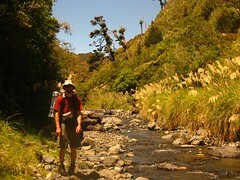 For the rest of the day, we’d be walking down the river to reach Mid Pohangina Hut. There are a couple of direct tracks heading from the hut towards the river, and the one we’d not come up earlier trends in the direction of Mid Pohangina. In fact, an old sign next to the river points to Mid Pohangina, stating that it’s “1 hour” away, although that’s a ridiculous time—at the far end we found the other sign that tiimed the same walk as 2.5 hours, which is far more realistic. We left at 12.30pm. On a nice day, which this was, the river is more like a stream. It’s ankle deep, only a stride or two wide, and slow-flowing. 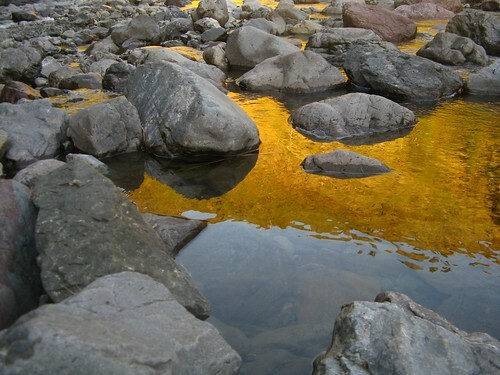 The wider stream-bed is generally wide enough to walk alongside the stream for much of the time, and this is just as well because it’s full of slippery brown rocks, so would be very slow to (safely) walk if it were necessary to walk in the river for the majority of the time. As is probably often the case with waterways that cut through mountain ranges, the stream has high and rather steep sides for much of the time, and I’d guess this could make the route tricky (if not impassable) if the river’s up by too much. After about 20 minutes, we reached the first minorly tricky gorgey bit, which involved some awkward leaping. 20 minutes later, at about 12.50pm, another short section gets gorgey enough such that someone has helpfully installed a chain along part of the rock-face on the true left, which made it much easier to get around. This chain can’t be seen from the up-river end, and we’d had to clamber up a small way before actually realising it was there. Before then I’d be considering staying in the river, and I think in either of these cases, it’d probably have been possible to simply go in the river and get wet for anyone inclined. There’s a danger of slipping and creating more problems, so I guess it’s one of those things to weigh up. We sat down for a break for a few minutes, then sidled around a notable small waterfall, and after that the stream-bed flattened out again for easier walking. This part looked tricky, but then we discovered a handy chain just around the corner. 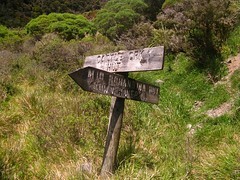 Just after 2pm, we reached the sign that marked the exit from the river to Mid Pohangina Hut. It’s an interesting configuration of sign and consequentual “track”. In particular, the sign has an arrow that points more or less to the top of a slip that looks as if it’s made of loose rock on slab, and there’s a large orange triangle at the top. I think if there was too much doubt, one could continue walking for a few minutes down the river to the end of the spur (where there’s a swing bridge), then back up the spur to the hut. Figuring that if DoC can recommend it then we should be able to do it, however, we set about trying to figure out where on earth we should be going. If you look carefully at a larger version of this photo, you should just see a big orange triangle at the base of the tree near the top, 3/4 of the way over from left to right. That’s Richard down in the creek to the left, trying to figure out if there’s some obvious route we’d missed, and Tim on the right figuring a way to get higher up the side to cross the slip horizontally. Richard and I basically went straight up the rock in the end, perhaps not the best idea. I think Tim had the best idea, which was to clamber up through vegetation on the up-stream side of the slip, then carefully sidle across it to the far side and head up to the triangle. Éamonn simply started on the down-stream side of the slip and clambered his way up, which he commented was a really crappy way. I have trouble seeing how it could be worse than the way Richard and I tried, however, which was the dead-minded compromise of simply trying to clamber straight up the slip, not so much made of scree as loose rocks. Richard’s done a fair amount of rock climbing, but I haven’t, and I think I would’ve preferred either of the other two options that likely would have been more stable. Ultimately we reached the triangle at the top, then followed the only ground trail downwards past Department of Conservation Asset number 084045 that was busy directing people up the hill from where we came, and immediately after arrived at Mid Pohangina Hut (also known as usurped Department of Conservation Asset number 042634). It was now 2.50pm, and the hut was empty. We’d thought we might have met up here with Garry and Bob, who were coming in from the western side of the range to collect us, but there was no sign of them, and they never showed up. It was no biggie because they’d not been sure they’d get the whole way in, but hopefully they’d still be at the road for us tomorrow. Asset Numb A nice swimming hole. 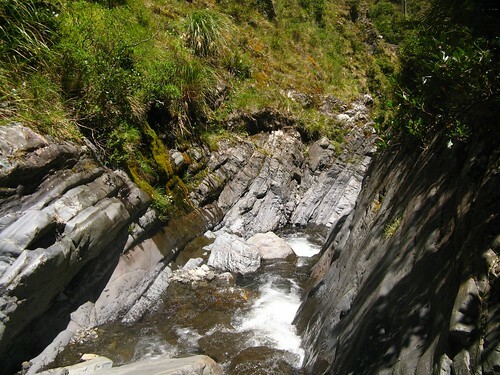 The Sun was still high in the sky, and we all hung out washing to dry, soon pushing through the toetoe to discover more of the the upper reaches of the Pohangina River, along with a great swimming hole and a nifty little waterfall. We all dipped in for a quick swim one way or another, but eventually got sick of the grouping sandflies, and one by one retreated back towards the hut, where a couple of big spiders guarded the doorway keeping sandflies at bay. Soon after 4pm as we were lazing around in the hut, a helicopter dropped down into the clearing in front of the hut, and a chap hopped out and asked if we were trampers or hunters. Seeing there were four of us, he decided he’d prefer to get dropped at the next hut up the river, and hopped back in probably Ngamoko from the direction they went. He didn’t seem too bad, but I was a little relieved we’d arrived when we did rather than a couple of hours later, because we’d not have had an option of going somewhere else if the hut had been taken over by a hunter. We spent the rest of the afternoon not doing much, cooked some dinner, and I went to sit outside for a while. Saturday night had a very clear sky, and we sat outside for some time in the evening watching satellites and meteors. 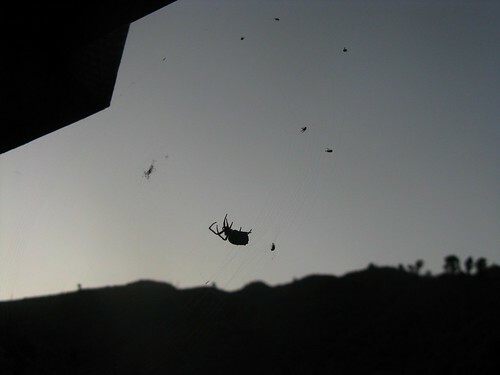 After some quick visits to Department of Conservation asset number 006433, Éamonn slept outside on the deck with the spiders, two particular ones of which fascinated us all for the entire time we were there, and the rest of us slept inside with the other spiders. We left at 8.20am next morning, following the directions of Department of Conservation Asset number 084046 down towards the nearby swing bridge (Note 6-Feb-2012 — swing bridge soon to be removed), at the lower end of the spur. Not long after leaving the hut, we met a lone hunter who only had day gear, and must have left early in the morning. He confirmed that he’d walked past a tent set up on the track about a third of the way in, which we decided must have been Garry and Bob. The track out to the western side of the range from here had a fearsome reputation for being overgrown, with many complaints in the hut book. We contemplated walking down the river to get out instead, but didn’t know enough about it, or the possibility of it being gorgey. Only one person in nearly a decade of hut book entries had written about considering the river route on a nice day (without having actually done it), and someone had scribbled nearby that it’d be a stupid idea, though with no explanation of why. From what we later saw of the river from above, it didn’t appear to be tricky to walk at all, with a possible exception of a space within a couple of kilometres of the exit, where it appeared that it might close in a little, but we could only see from a distance. 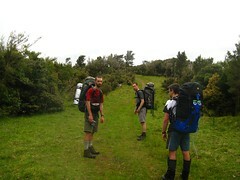 The sidling track actually wasn’t bad at all compared with what we were expecting. It’s a typical sidling track, with occasional side creeks running over it, and a few spaces being quite thin or falling away, but plenty of vegetation to hold onto, and little chance of falling a long way. 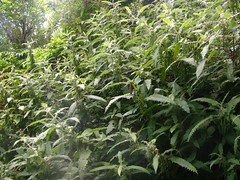 Its biggest down side, as we soon discovered, were recurring patches of Onga Onga, also known as Stinging Nettle. The Onga Onga made what would be a potentially fast sidling track into a rather slow one. I was thinking some belly dancing skills might be of great help, and at about the same time Éamonn piped in claiming that the next World Hula Hoop Championships should be held along this track. As we followed the sidle, the same helicopter we’d seen the day before was doing the rounds running up and down the valley, presumably dropping hunters in at various huts all over. We stopped on a small outcropping for a break over the river, and watched it fly back and forth several times. I guess if you’re running a helicopter business, you’d want to fly everyone in and out at the same time so as to avoid wearing out the engine with more restarts than necessary. The part of the river at the lower end of this photo was the only part we could see that we thought might be potentially tricky to get through, and might require swimming. Although there was much of the river we never saw. Two thirds of the way back to the road, Éamonn spotted a matchbox on the track, and on closer inspection discovered it contained a note from Garry and Bob to indicate that this was as far as they’d gotten. There wasn’t much space, but we could pick out the impressions of where a tent had been on the track, and sure enough we reached a small side creek within a minute after, which would have been their overnight water source. One thing about this track is that the current LINZ Topo50 map shows parts of it in a completely wrong place. 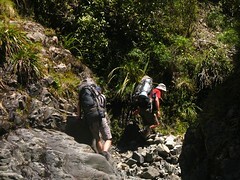 Notably, much of the track is shown down at river level, though for most of the time we probably sidled 60 metres or more vertically above the river. I have a suspicion that an old track, possibly overgrown, follows the river more closely, and at 12.10pm we did pass a track junction leading down to Centre Creek shortly after midday, which would have gone down to the river (I think) to meet another track heading up a spur on the far side. It’s probably worth mentioning that Centre Creek Biv was removed some time ago. It really wasn’t as bad as it looks. All that remained for negotiation was one giant patch of Onga Onga, which we duly snuck under mostly avoiding contact. I think this is the first big one that’s encountered when coming in from the road, and it was nearly possible to see how people would walk straight into it without realising enough to be on watch. For the record, it’s about 3 minutes in from the Ruahine Forest Park sign, which can be found at the point where the track begins to lead up from the true right of the Pohangina River. And therefore we had now reached the river, and with about 15 minutes of walking, arrived on farmland. We reached a fence at 12.45pm, and then finished the final small climb up a 4WD track to the road, where Garry and Bob had been happily waiting for about an hour. So that was good timing. For various reasons this is probably the last chance I’ll have to visit the Ruahines, at least for a while, and it was a little sad to say goodbye to my second favourite mountain range. I’m sure I’ll be back in time, though. 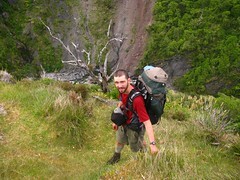 This entry was posted in tramping and tagged bagged:cattle creek hut, bagged:mid pohangina hut, bagged:stanfield hut, ruahines, tramping, wellington tramping and mountaineering club. Bookmark the permalink. Nice write up as usual. 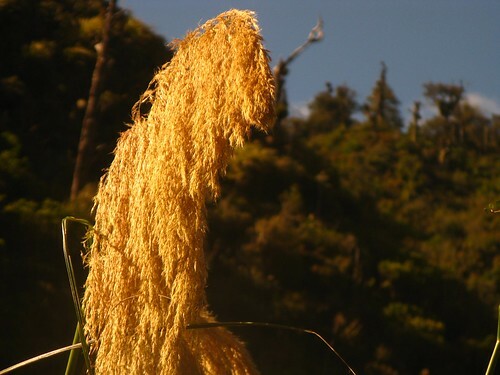 Always good to be reminded that the Ruahine always seem to have a few tricks up the sleeve. Hi John A, thanks for confirming that suspicion about the route. I know it can certainly get windy along there. 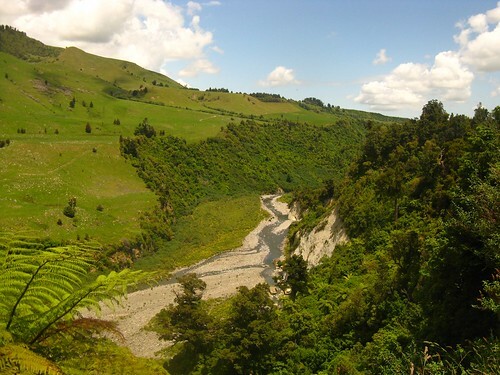 One of the banner photos along the top of this website (the black and white one) was taken along that ridge above Cattle Creek Hut. Robb and John, thanks for the comments. The long story short is that I’m shifting to Melbourne at the end of this year, at least for a while. It’s been a very hard decision for us and is taking time to get my head around, but I guess it’s new opportunities and such. I’ll post something about it more properly soon. Robb, the helicopter was more of a curiosity on this occasion, but I know what you mean. If we’d arrived somewhere nice and then had someone dropped in on us with massive amounts of supplies, it may have been quite annoying. Just out of interest do you remember what helecoptor operator was in the area? I’m afraid I wouldn’t have a clue who the operator was. You could perhaps contact Robb (who posted a comment above) as he seems to know some of the local operators. Just a quick addendum to this trip report for anyone who reads it for info, DoC has recently decided that the Mid-Pohangina Swing Bridge is near its use-by date, and will soon be removing it (as opposed to fixing or maintaining it).